Mohssine Nachit is a professor of intercultural communication and dialogue at Moulay Ismail University, in Meknes. The university was founded in 1989, although schools of sciences, arts, and humanities had existed as part of a university in Fez since 1982. His wife runs the riad where I am staying. I contacted him by e-mail before the trip, saying that I wanted to learn something about Berber culture and perhaps visit some Berber towns or villages. This was before I realized that such a request was like contacting an American professor and saying that you wanted to learn about white people, or Southerners, or people with European ancestry. People of Berber blood and Berber culture suffuses Morocco; their influence is as ubiquitous as that of Arabs. But don’t call them Berbers around the professor. He is one of the people who consider it a disparaging term. The correct one is Amazigh, which he and others here pronounce “Amazeer.” It means “free people” in the Amazigh language. The word “Berber,” however, is universally used in guidebooks and on the web, which suggests to me that Nachit’s view is a minority one. There are places in the country that are predominantly Berber, the towns of Azrou and Khemisset south of Meknes among them. Many Berbers are farmers and strongly identified with the land. They also have one tradition not shared with Arab Moroccans—dancing in which men and women have physical contact. The dance is called “ahidousse.” It predates the arrival of Islam and is not frowned upon,” the professor said. The Berbers were the original inhabitants of Morocco (and much of the Mahgreb), which was later settled by Jews, Romans, Arabs, and Europeans. At various times many Berbers were Jewish or Christian; now all are Muslim. Weaving of both rugs and cloth is a Berber activity important for both economic and cultural reasons. It is done almost exclusively by women. This is changing, however. 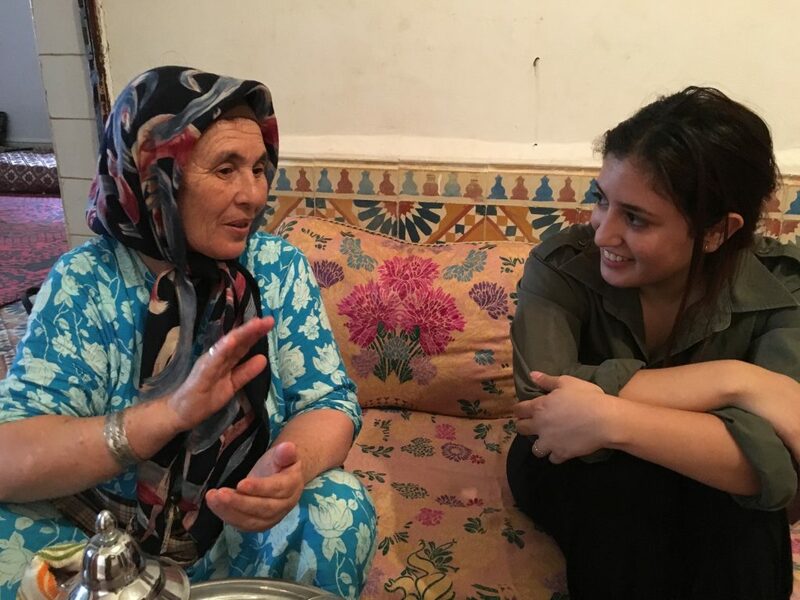 Today, young Berber women prefer to study or go abroad and not stay home and weave, he said. The weaving tradition has remained more intact in isolated rural villages. Regions have their own design traditions. Only in Azrou and areas near it is blue used as a dominant color. A group called the Gerwain is among the few that uses pink. One of the more distinctive designs are made by a group of Berbers called the Beni Ouarain, high in the Middle Atlas. Beni Ouarain rugs are popular with high-end interior designers in the United States because of their coolness and minimalism. They are almost entirely white and black, which Nachit said references the snowiness of their geographic home. The white wool is often shaggy and the black designs often abstract, like Joan Miro or Paul Klee. When I told Professor Nachit that I would like to see some Berber weavers and possibly buy a rug, he suggested I go to Khemisset, southwest of Meknes on the way to Rabat. He said I should try to find a woman named “Hada,” who was the grand-dame of carpet making there and from whom he’d bought some carpets over many years. Unfortunately, he added, he didn’t have Hada’s address, cell phone number, or even last name. But he assured me that if I stopped at the large carpet shop you see right when you enter the town, somebody there could direct us to Hada. A few days later, I set off to look for Hada. With me was Sanaa, a 23-year-old woman, just out of film school, who I’d hired as an interpreter for a few days. In retrospect, I can’t imagine what Professor Nachit was thinking. I had the impression that Khemisset was going to be a one-stoplight village. It turns out to be a city of 130,000 people. There is no one main road into town that I was able to detect, and there was no carpet store in plain view. When Sanaa and I got there we saw no obvious place to stop and inquire as to Hada’s whereabouts—the notion was ridiculous, in fact—so we drove into town hoping to find a souk selling carpets, or a crafts cooperative, or some obvious place to inquire. We found nothing but the usual cubical concrete buildings with steel doors; streets, many torn up, with lots of red dust; and small amount of foot traffic, it being Saturday. We took many turns until we couldn’t have found our way back to the road that brought us into town even if we’d wanted to look for Nachit’s carpet store again. I suggested we ask someone on the street about a place we could get rugs. We pulled over and Sanaa asked an older man walking by. He was no help. We drove around and stopped again. While I searched on my phone for a carpet shop Sanaa approached a group of young men behind us. To my surprise, she returned to the car with a 36-year-old man named Mohammed. He said he could take us to a man who was a rug dealer. He had a car (and later told me he buys and sells cars, when I inquired as to his job.) We followed him. In a short time, we pulled over in front of an unfinished house. It had three gray steel doors on the ground level, which appeared to be a garage. Above it was a wall whose lower half was stucco and upper half exposed brick. There were three window openings with no glass. A red and black rug hung out of one window. Rebar rods stuck from the unfinished second floor. It was impossible to tell if the house had a living quarters. There were a few nice houses nearby, but the unbuilt lots were weedy, and the neighborhood was unappealing. Mohammed went to a side door and came back and said someone would help us in a minute. 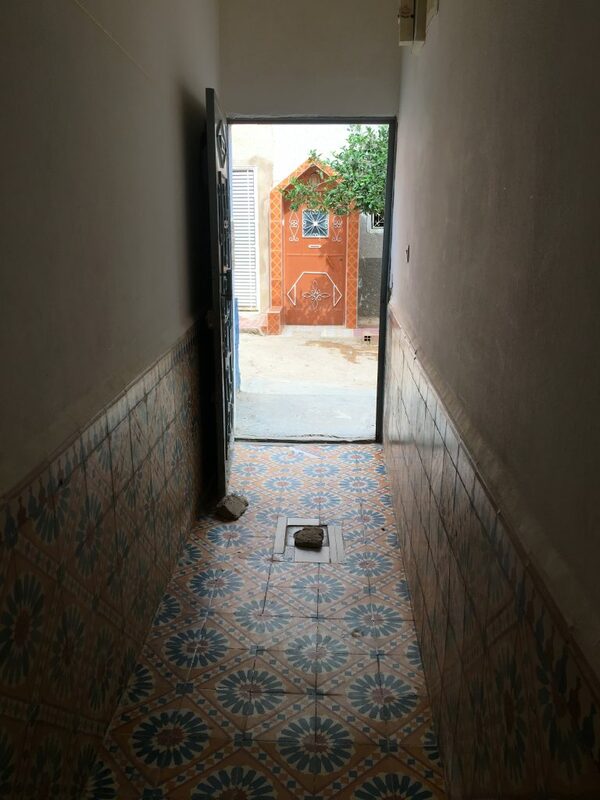 Soon, one of the bottom doors opened to reveal a tall man, a white van, and an unfinished room stacked with folded carpets. We stepped inside and introduced ourselves and said we were looking for a woman named Hada who was a rug expert. Did he know such a person? His name was Kareem and he said he knew two women named Hada who might fit the bill. One of them had two houses, however. We waited around downstairs while he talked to someone upstairs. Two small boys appeared when he returned. One of them clung to his leg. There was a tray with tea glasses on a table, but he didn’t offer us tea. He did, however, say he was willing to take us to the Hadas. He put his children in the front seat of his van. The older one, probably eight, sat in the driver’s seat and pretended he was driving. Kareem got in and pulled the van out. I was already feeling bad that we’d imposed on him, his children, and whomever might be unseen in the house. I gave a little money to Mohammed, and Sanaa and I took off behind Kareem. We drove through a nicer neighborhood that had white stucco walls (stained brown at street level) around the houses, and then into a more modest one. Kareem pulled over, got out of the van and then, halfway across the street, returned to it and grabbed his younger son, who was about three, through the driver’s window. He knocked on a door and spoke with someone, then returned to the van. Whether this was one of the houses of the two-house Hada I never learned. We followed him into a commercial neighborhood, stopping to let pass a man pulling a cart covered with limes. A block later we did the same thing for a man with a cart with tomatoes on it. By this time, I’d decided that if the next stop didn’t reveal Hada, we’d call it quits and go to some village out in the countryside. We stopped in on a street of new houses. Kareem got out and knocked on a door. Someone answered and they spoke. Several minutes later, a stout woman in a blue dress with a tightly wrapped head scarf stepped through the door. Kareem introduced us to Hada. 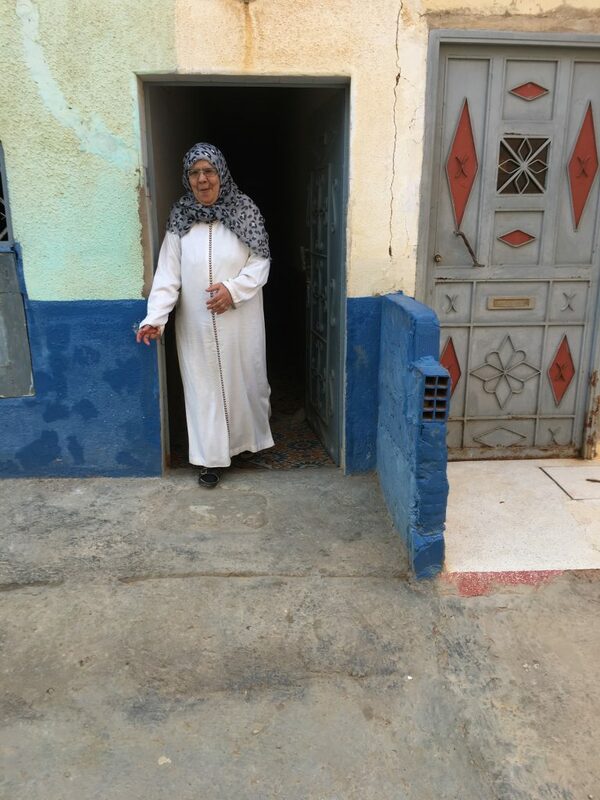 I asked if she was the Hada who knew Professor Nachit from Meknes. She said yes, she had worked with his father, and she knew him. She invited us in. 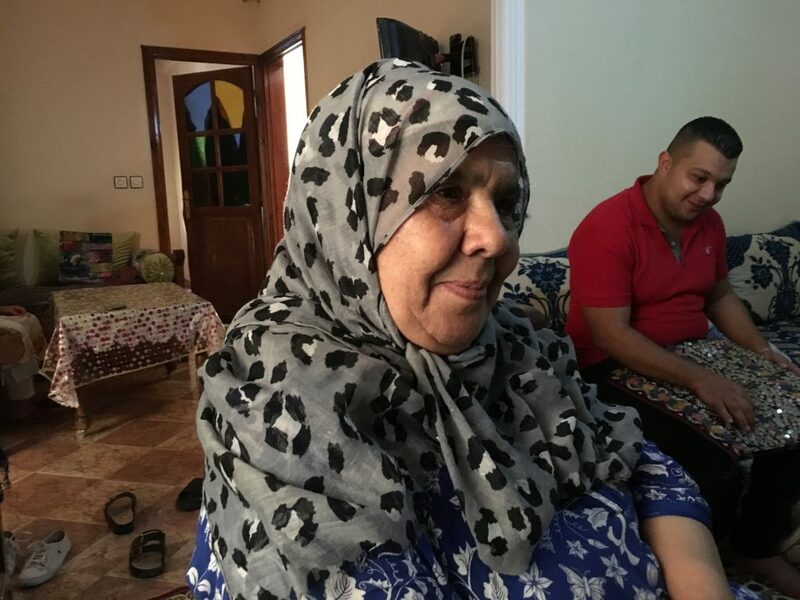 I couldn’t quite believe that we’d driven to an obscure city and found ourselves within two degrees of separation—Mohammed and Kareem—from a woman whose last name we didn’t even know. We thanked Kareem effusively. He refused money until I insisted he take a small amount as a symbol of my gratitude. We stepped into the house and took off our shoes. A woman about Hada’s age sat at a table in an anteroom. It was separated by a half wall from the living room, which was darker and had built-in seating covered with cushions along the walls. We sat down. I wanted to give Hada—whose full name was Hada Ourahou—a sense of me and my purpose before I launched into an interview interpreted by Sanaa. 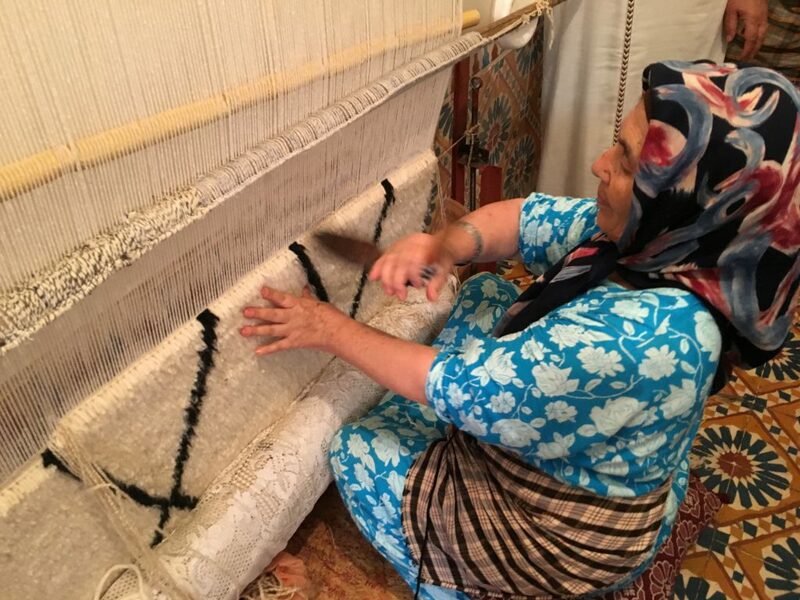 So, I said, in fractured French, that I had heard of her from Professor Nachit, was interested in Berber carpet-making, would love to hear about her work and life. I said I also hoped she might be able to take us to see someone making a rug at home—something that Professor Nachit said she’d probably be willing to do. She watched me while I spoke, occasionally saying a word or two in French, and nodded her assent when I was finished. She had an impish smile that was exaggerated by a gray and black scarf that covered her hair and most of her forehead. I sat between her and Sanaa. Partway through our conversation her son appeared with a tray with a teapot and glasses, and she poured all of us the usual sweetened mint tea. Hada had stopped making carpets five or six years earlier. Making a carpet sometimes took six months, and she no longer had the energy for it. Now, she’s a carpet dealer. She brought that first carpet with her when she got married and moved to a house with her husband. It’s gone now. She said it took her about five years to become good at weaving. 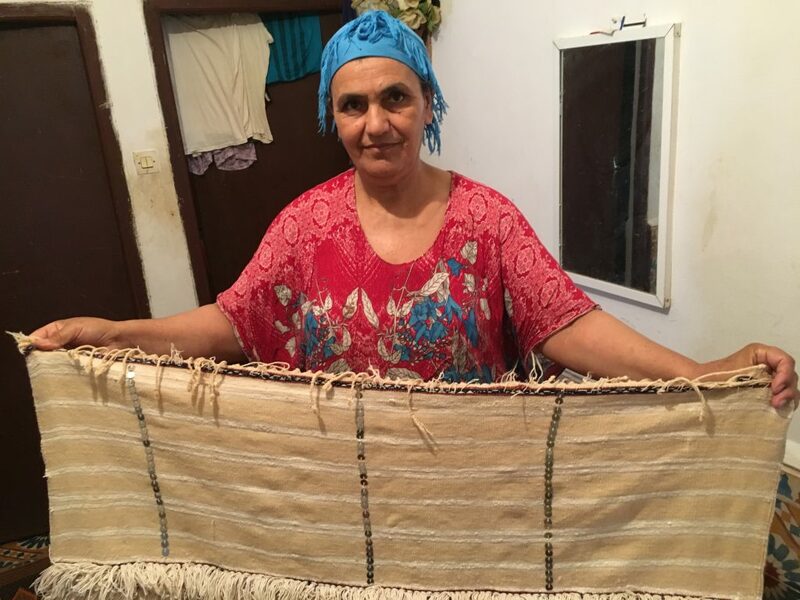 She guessed she’d made 500 rugs in her life, selling nearly all of them. I asked where she got the designs, and she tapped her head. She selected colors that went with each other, “like putting on clothes, matching shirt to pants.” If a client wanted a rug that looked like one she’d made, she was happy to weave a duplicate. Only women and girls are still making rugs, she said. It was always women’s work because it could be done in the home and fitted into the tasks of homemaking and childrearing, which were women’s responsibilities. Children also used to make rugs, but no more. I asked her how far she went in school. She said she left at age 19. I asked her how old she was now, and she said 64. “And still working!” she said with a laugh, reaching out to shake my hand in solidarity. Girls who want to go on to higher education have no interest in weaving, she said. Today, only five percent of girls learn to weave, although when she was a child nearly all did, and also learned ancillary skills such as spinning and dyeing. “In the villages, people now have cell phones, Facebook, WhatsApp. The old people have the time, the young people don’t,” she said. I asked about her own family. She’s a widow; her husband, a career soldier, died seven years ago. She has three sons and four grandchildren—three boys and one girl. The girl’s mother doesn’t want her daughter to make carpets. “Of course, I’m sad. This will die,” she said. 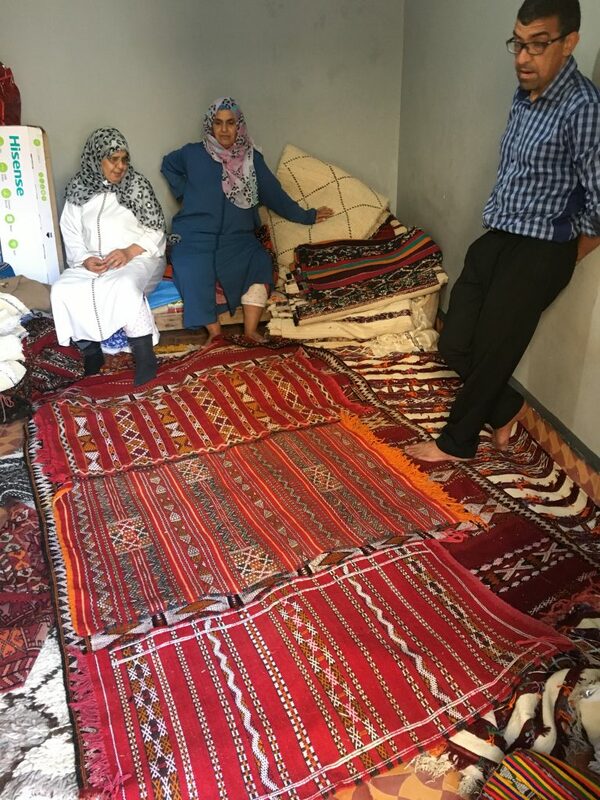 Partway through our conversation, Hada had gotten up and stepped back from the living room to make a phone call to a woman she knew who might be making a carpet in her home. Sanaa later said that before making the call she’d said to the woman in the anteroom, in Arabic, “It’s not a good plan.” The woman gave Sanaa an embarrassed look when she realized she’d heard the comment. But it turns out the weaver was at home and willing to have us visit. Hada put on a djellaba. Four of us—we were joined by a woman named Taaroucht, Hada’s best friend, who’d appeared at the house at some point—got into the car and drove off. We arrived at a house in a more modest neighborhood. Hada knocked on the door and was let in. We followed. The entranceway led to a small living room with a couch and a few low stools. 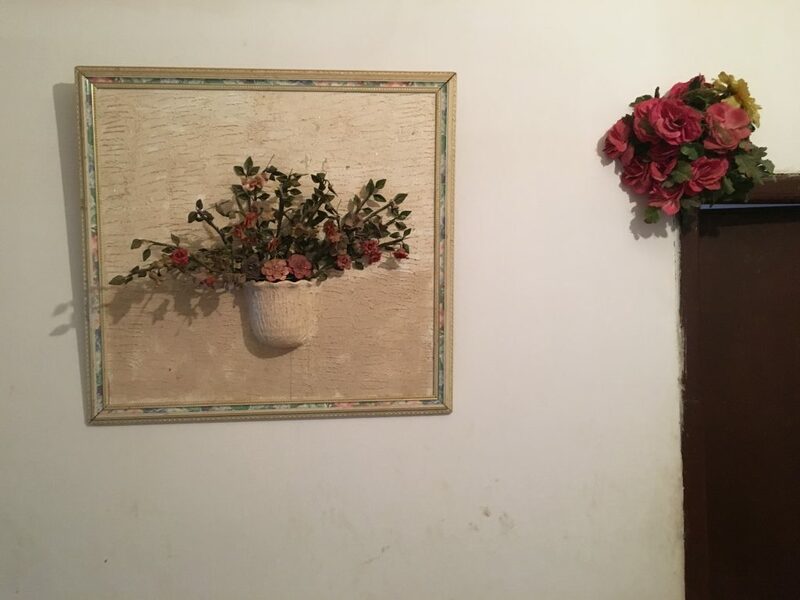 On the wall were five bouquets of artificial flowers. Off the living room and parallel to the entranceway was a room that was both kitchen and workshop. The weaver was a woman named Fatima Belaamri. She had a red, blue, and tan headscarf. At one point in the visit I asked her how old she was. She said she didn’t know but would show me a card that might help. She went into one of the two bedrooms and returned with an identity card that had her birth year as 1964. So, she was 54 or thereabout, although she looked older than me. She went into the weaving room, sat on the floor, and knotted a few rows of the rug, which was stretched vertically against a wall in front of her. She cut the leftover thread from each knot with knife wielded with lightning speed. The rug was white with a sparse black design—a sort of Beni Ouarain knockoff. It was for a client in Marrakesh. She’d been working on it intermittently for three months and expected to finish it in a week. Working fulltime, it would have taken about a month, but she’d had a busy summer with weddings and other activities. She would get 1,300 Dh for it—about $140. I asked her where she got her designs, as I could not see a pattern in front of her. “Just always in the head,” she said. She asked if we wanted tea. We couldn’t refuse, so she made it and brought it out into the living room, where we talked. Her parents had lived in a village, but she’d grown up in the city with an uncle. (No reason given, and I didn’t ask.) The uncle, who was in the army, had no children, and she considered him her father. She’d gone to school for only two years and didn’t know how to read or write. She’d learned to knot and weave carpets starting at age 12. She has seven children—five daughters and two sons. All the daughters make carpets, as do seven granddaughters. Her husband, a truck driver, had died a year ago. Another woman, younger than the weaver, was also there. As we were waiting for the tea to arrive, she went into the second bedroom and brought out four rugs that were rolled up and tied. I always feel bad when someone starts unbundling carpets to show, but there was no stopping her. Two of them were black-on-white designs like the one in the works, and two were made from scraps of old carpets. As an example of frugal recycling, like New England oval rag rugs, they were interesting, although they were also pretty ugly. If I’d had more room in my suitcase I might have bought one as a gesture of thanks. We had tea and some cookies. After a while, the woman asked us if we wanted to stay for lunch. We thanked her profusely but said absolutely not. 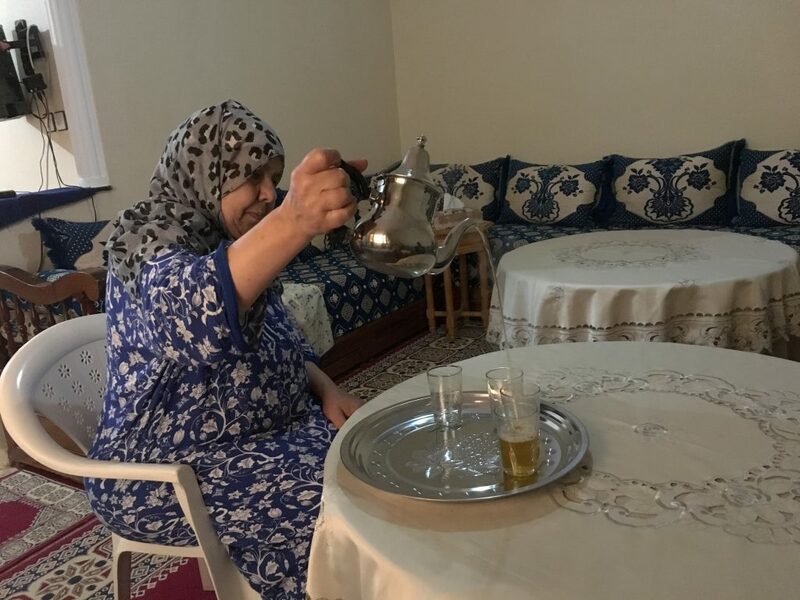 “When you come back to Morocco, this is your home,” she said. I thanked her for showing us her work, and for answering my questions. I gave her 100 Dh, but she would have taken nothing. As I waited to get into the car in the alley out front, a girl in a red dress with beautiful dark hair came by on a scooter. We returned to Hada’s house and got serious about looking at—and buying—rugs. We stepped into the garage next to the house where they were stored and she began unfolding and shaking ones into full view. There was a lot of conversation, not on price but on what members of the group thought about each of them. I finally bought three: an orange knotted one fron Ait Yadine that was about two years old; a red one from Ait Abbou that was about five years old; and a tan one from Khemisset that was 2 years old. I did not try to argue down the price on any of them. We thanked Hada for all she had done, and also thanked her son and Taaroucht. Then we left. 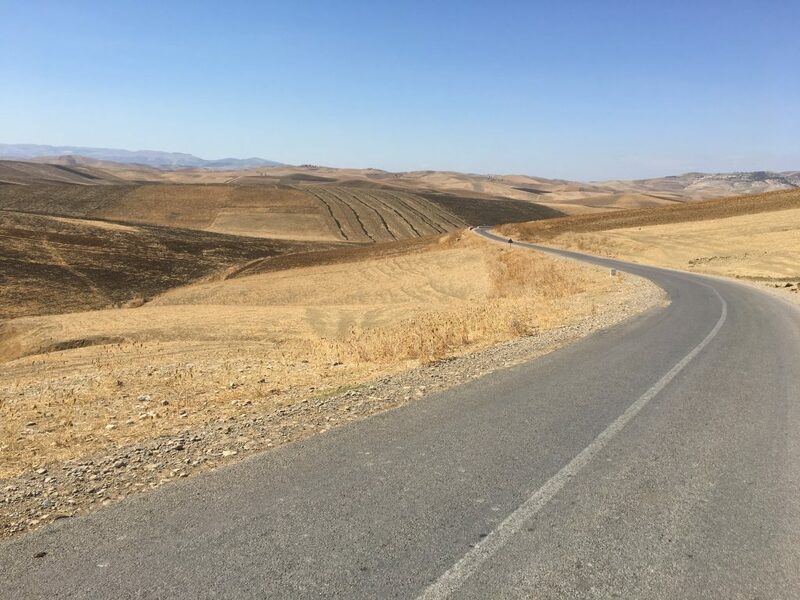 Driving back to Meknes we passed plowed fields that were dry and devoid of vegetation; a few had also been burned. We passed olive groves, some with netting over the trees. We passed donkeys burdened with goods or riders. We passed a man walking a bicycle up a hill with four sacks of onions, two on the front and rear forks, like makeshift saddlebags. We passed roadside stands with vegetables, bags of nuts, and bottles of yellow olive oil. Sanaa, who doesn’t drive, spent a fair amount of time looking at her Android phone. It had a dog on the home screen, which seemed unusual for someone in a country whose main religion considers dogs unclean. On the back was a sticker of Jimi Hendrix. I asked her how my introductory speech in French to Hada had gone. “It was full of faults,” she said.